The peace loving inhabitants of the planet Akir are threatened with extinction unless they submit to a ruthless conqueror, Sador, who possesses the most awesome weapon in the universe - a stellar converter. While Sador is engaged in eliminating another planet which refuses to submit, the Akira have a brief spell in which to organise a defensive campaign. Shad, a young emissary sent by the Akirian council to seek aid from inter-galactic soldiers of fortune, is directed first to Dr. Hephaestus, hoping to secure robot reinforcements. The doctor is only concerned with keeping Shad captive in order to mate with his beautiful daughter Nanalia. Escape is achieved with the aid of the sympathetic Nanelia who follows Shad as he continues his quest and encounters an inter-galactic adventurer named Cowboy, who agrees to join his mission. A alien mercenary named Cayman, a huge lizard-like creature, also agrees to join the Akirian defence, intent on revenge - his own planet was destroyed by the evil Sador. Further volunteers are enlisted including the Nestors - five clones who think and react as one being, St. Exmin, a voluptuous warrior from the planet Valkiri, and Gelt, a criminal wanted throughout the universe. The seven ships return to Akir - just as the colossal war is about to begin with the dreaded Sador. 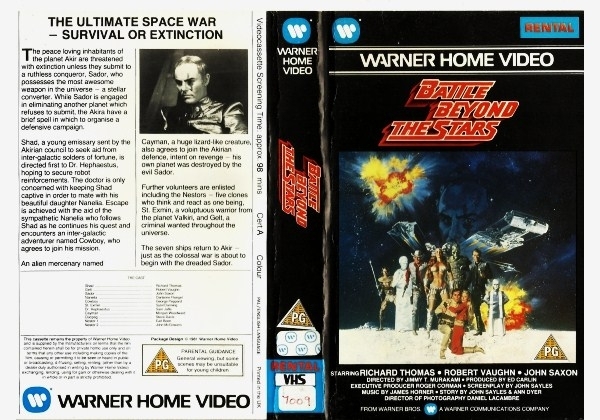 Or find "Battle Beyond The Stars" on VHS and DVD / BluRay at Amazon.